I was honored to be asked by OMSI to participate in the Portland Mini Maker Faire. Although Alice and Shelly could not be with me, It was still a wonderful experience. It makes my heart smile when I work with children and see the talent in their small hands. Children are so eager to learn. At the show I had the opportunity to teach children to use a jewelers saw to cut their designs out of copper and create a pendant. I am so disappointed I did not get any photos of their creations. They were so creative- an open book, a dog bone and a unicorn to mention a few. The younger children learned how to use a flex shaft to drill a hole in a LEGO to create a pendant. The great part about teaching children what I do is to see girls and young women work with tools. When some approach me they are intimidated to use a drill or a saw, I want to help change that and encourage girls to work with tools, be creative and strong…and always playwell. 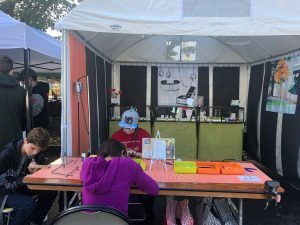 Which ties into why we created Womens Brick Initiative, We (Me, Shelly of Corbett Photography and Alice of Bippitybricks) debuted our plan at the Mini Makers Faire in Seattle in August. Our goal is to inspire girls and women to work creatively with LEGO. When we go out into the community to teach or learn there are always new experiences hiding around the corner we didn’t know about. I am very thankful for all the connections I made and the possible opportunities that lay ahead. Tagged Jacqueline, Jewelry, LEGO, Portland Mini Maker Faire.